The Twitter IPO moved into its final phase, with the announcement last week of the preliminary pricing estimates per share and details of the offering. The company surprised many investors by setting an offering price of $17 to $20 per share, at the low end of market expectations, and pairing it with a plan to sell 70 million shares. 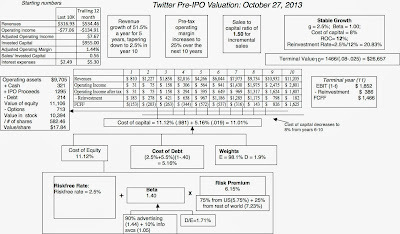 Having posted on my estimate of Twitter’s price when the IPO was first announced and following up with my estimate of value, when the company filed its prospectus (S-1) with Twitter, I thought it would make sense to both update my valuation, with the new information that has emerged since, and to try to make sense of the pricing game that Twitter and its bankers are playing. 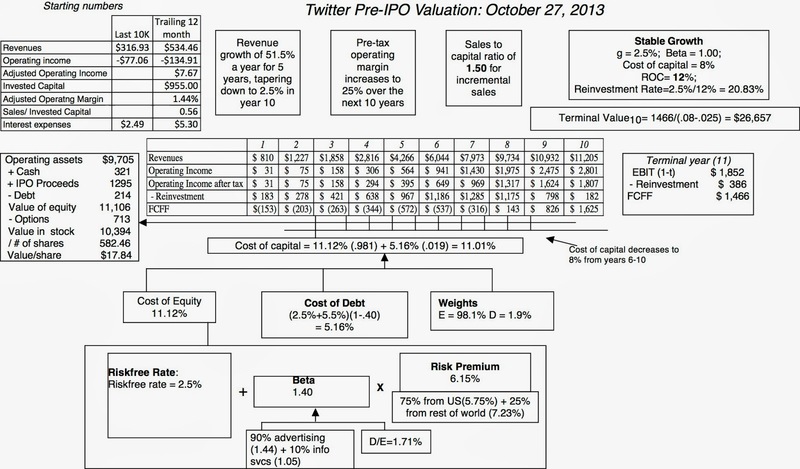 In my original valuation of Twitter, just over a month ago, I used the Twitter's initial S-1 filing which contained information through the first two quarters of 2013 (ending June 30, 2013) and the rough details of what investors expected the IPO proceeds to be. Since then, Twitter has released three amended filings with the most recent one containing third quarter operating details and share numbers that reflect changes since June 30. Incorporating the information in this filing as well as the offering details contained in the report leads me to a (mostly minor) reassessment of my estimate of Twitter’s value. As with prior periods, the R&D expense was a major reason for the reported losses and capitalizing that value does make the company very mildly profitable. Note that while the numbers have shifted significantly, there is little in the report that would lead me to reassess my narrative for the company: it remains a young company with significant growth potential in a competitive market. Consequently, my targeted revenues in 2023 ($11.2 billion) and the operating margin estimates (25%) for the company remain close to my initial estimates (October 5). IPO proceeds: In the most recent filing, the company announced its intent to issue 70 million shares, with the option to increase that number by 10.5 million shares. In conjunction with the price range of $17-$20 that is also specified, that implies that the proceeds from the offering will range anywhere from $1.19 billion (70 million shares at $17/share) at the low end to $1.61 billion (80.5 million shares at $20/share) at the high end. In my valuation, I will assume that the offering will happen at the mid-range price ($18.50) and that the option to expand the offering will not be utilized, leading to an expected proceeds of $1.295 billion. Now that the company (and its bankers) have announced a price range ($17-$20) that is close to my estimate of value, my ego, of course, wants me to believe that this is a testimonial to my valuation skills but I know better. There is a fairy tale scenario, where my value is right, Goldman Sachs has come up with a value very close to mine and the market price happens to reflect that value. It is a fantasy for a simple reason. As I noted in my price versus value post, the IPO process has little to do with value and everything to do with price, and given how the market is pricing other social media companies, I find it difficult to believe that price and value have magically converged, with Twitter. The underwriting skew: The Twitter IPO, like most public offerings, is backed by an underwriting guarantee from bankers that they will deliver the agreed upon offering price. If the offering price is set too high, relative to the fair price, that creates a substantial cost to the bankers, whereas if it is set too low, the cost is much smaller. Not surprisingly, IPOs tend to be underpriced, on average, by about 10-15% as I noted in this prior post. The PR twist: There is a public relations and marketing component to what happens on the offering date that cannot be under estimated. To provide a contrast, look at the reactions to the Facebook and Linkedin offerings in both the immediate aftermath of and in the weeks after the offering. While both IPOs were mispriced by the same lead banker (Morgan Stanley), with Facebook being over priced and Linkedin being under priced, Morgan Stanley was bashed for doing the former and emerged relatively unscathed from the latter. In the months after the offering, Facebook saw its shares lose more ground, as institutional investors abandoned it, while LinkedIn shares were carried higher, at least partly because of the opening day momentum. The feedback loop: I know that the bankers have been testing out the level of enthusiasm among investors for the Twitter offering and I find it difficult to believe that they are not incorporating that into their pricing. In other words, if they want excitement at the road show, it will come from investors thinking that they are getting a bargain and not from being offered a fair deal. My completely uninformed guess is that the bankers think that Twitter’s fair price is closer to $25/share and that they have set the range at roughly 20% below those estimates. If the offering goes as choreographed, here is how it should unfold. The road show will be well received and the bankers will announce (reluctantly) that the high enthusiasm shown by investors has pushed them to set the offering price at $20/share. Institutional investors will start lining up for their preferred allotments at that offering price and the enthusiasm bubble will grow. On the offering date, the stock will jump about 20%-25%, leading to headlines the next day about the riches endowed on those who were lucky or privileged enough to get the shares in the offering. Some of the rest of us, who were not lucky or privileged enough to be part of the offering, will be drawn by these news stories into the stock, pushing the price higher, and keeping the momentum game going. In a few months or perhaps a year, some of the owners of Twitter (big investors and venture capitalists) will be able to sell their shares and cash out. So, what can go wrong with this script? The biggest actor in this play is Mr. Market, a notoriously moody, unpredictable and perhaps bipolar (though that may require a clinical judgment) character. As was the case in Facebook, a last minute tantrum by Mr. Market can lay waste the best laid plans of banks and analysts. Only a small fraction of the equity is being offered to the public on the offering date: If all of Twitter being offered for sale on the offering date, an underpricing of 20% (selling the shares at $20, when the fair price is $25) would cost investors almost $3 billion in value (since the company would be priced at $12 billion instead of $15 billion). However, as noted earlier, only $1.2 to $1.6 billion will be offered to investors in the IPP. Even if you take the upper end of this amount ($1.6 billion), a 20% under pricing would translate into a loss of $400 million to the owners. While that may be a lot of money to most of us, it would work out to about 3% of overall value for the existing owners. The existing investors in Twitter are neither babes in the wood nor naïve fools: The current owners in Twitter are a who's who of venture capital investing, entirely capable of watching out for their own interests and just as likely to use bankers as they are to be used by them. Rather than being victims here of the under pricing, they are willing accomplices in this pricing process, who view the loss on the opening day as a small cost to pay for a more lucrative later exit. There are some winners, though none of them emerge unscathed from the process. The first are the bankers, who by under pricing the offering enough, render the underwriting guarantee moot and get paid for it anyway. Here again, though, issuers are not entirely helpless and Twitter managed to get a discount on the underwriting fees. The second are those investors who are allotted shares at the offering price, many of whom are preferred clientele for the banks. They generally tend to be wealthier investors (institutions and individuals) who bring in revenues in other ways to the banks (as private banking clients or through trading). Since banks are not altruistic, I am not sure that these preferred clients end up with a bargain if you count the other fees they fork out to banks. The third is the financial media (and that includes bloggers) that can use the IPO as grist for the mill, churning out endless stories (and blog posts) about the IPO. If you buy into my cynical view of the Twitter IPO, it does make the whole process seem like a charade and raises questions about whether it is needed. What if we could skip the bankers, the offering price, the road shows and the endless debate about what will happen on the offering date and just go directly to the offering? It is true that bankers play other roles in the process that may be difficult to replace in some IPOs, but I am not sure that can be said about their role in Twitter. If investors have never heard off or know little about a company, the banker may provide credibility to the company with investors. Not only is Twitter as recognized a name as Goldman Sachs, it may have more credibility with investors. Bankers can price the stock, not only by looking at what the market is paying for similar stocks, but also by testing the price with investors. Since the stock has had VC transactions as well as acquisitions where the stock has been effectively priced, the banker has less work to do. Use their sales forces and road shows to get investors interested in the stock and excited about the offering. The sector is already "buzzed" and if you set the price at 25% below the “fair” price, you don’t really have to sell it very much. In the months after the offering, the bankers may step in and provide price support in the face of selling. With a $12 billion company, banks don’t have the capital or deep pockets to provide more than surface support. Guide the company in financing & dividend policy and in interactions with markets. Bankers know little about running social media businesses, which don't use much debt and have no cash to pay dividends/ buy back stock. Looking at the facts, I think that Twitter could have saved itself some money and time if it had followed Google and chosen an auction process for its public offering. After all, if your job is pricing, who does it better than the market? On the other hand, the ceremony and ritual of the IPO process, useless and predictable though it might be in most cases, may play a role in easing the transition of the company to the public market place and setting a narrative for the momentum game. Try to get an allotment of shares at the offering price: While the odds may be in your favor, it is definitely not a risk free or costless strategy and please do pay heed to some of the suggestions in this post. Wait until the offering date and play the momentum game: The trading game begins on opening day and stocks like Twitter are a momentum investors' dream (and nightmare) as prices are moved up and brought down by wisps of information and mood changes. If you are good at this game, you can play it for profit, as long as you do not let delusions of being an investor get in the way. Buy the stock as a long term investor: I do not have a deep rooted aversion to buying young or money losing companies, if the price is right. Given my estimate of value ($18/share), the stock would be, at best, a fair value at the offering price and I can think of far less ulcer-inducing investments that earn their fair value. That does not mean that Twitter will never be on my radar. If the momentum game turns against the stock and the price drops to $10/share, I will be ready to buy. Entertainment/ educational value: I am enjoying and will continue to enjoy every moment of this IPO for sheer entertainment value, as I listen to analysts make hilariously ill conceived arguments for or against the stock and portfolio managers act as if they are making reasoned judgments about value while desperately checking out momentum indicators. This is the ultimate reality show and I am just waiting for Ashton Kutcher, Kanye West and Lady Gaga to show up as Twitter IPO experts on CNBC. This post is really useful for all traders and investors of India on share market. I appreciate the effort kept by the author for publishing this post. I also request to keep posting such useful articles for option tips in the financial field. In that attempt, I also recommend to get some more information on . You are totally wrong here this stock will easily go to $30 and higher because supply outstrips demand. professor your tangential comment hits the nail on the head "social media businesses, which don't use much debt and have no cash to pay dividends/ buy back stock" ..suffice to say most probably never will either! @anonymous Pay dividend or buy backs, like google when it floated, the failure here is understand that twitter can be as big google et al. IMHO it has been valued as an established business with a steady revenue by the learned professor but that is not what it is at all. As always, a very well written and clear article. I enjoy all of your posts. I am unsure if I agree with cutting out the bankers in this transaction. In my opinion, GOOG fumbled the ball multiple times. At the time of the auction, the market was skeptic on the decision and you can make a similar argument, in a number of different ways, that money was left on the table. Only time will tell on this one...However, as you mentioned, these are sophisticated VC's starting to exit, so most likely selected GS because its the best option and/or GS bankers are good salesmen. Bankers should wigh in on the underperformance of IDBI to know the outcome. Mars Mission on track; orbit to be raised tomorrow...since the launch, the control of the mission has been taken over by scientists at ISRO Telemetry, Tracking and Command Network (ISTRAC) at Bangalore. There is the old story about the market craze in sardine trading when the sardines disappeared from the traditional waters in Monterey, California. The commodity traders bid them up and the price of a can of sardines soared. One day a buyer decided to treat himself to an expensive meal and actually opened a can and started eating. He immediately became ill and told the seller the sardines were no good. The seller said, "you don't understand. These are not eating sardines, they are trading sardines." Great read and take on the bankers. Wouldn't it be great to get back to what a real market was......or, am i wrong? Aswath, do you think it was better before the big IBanks? great valuation...was a treat reading this! Thank you Mr. Damodaran! No doubt shares prices will sore. But is it fair to put such a high a price on the terminal value, when in all likelyhood Twitter will not be around in 20 years, not to mention a 100 years? I want to know why did you divide the terminal FCF with risk premium percentage and then discounted it to present value? The annual headline inflation is expected to moderate to near 5 percent as there was reasonable price stability in some major commodities, the finance minister said on Thursday. P. Chidambaram made the comment in a lecture at the National University of Singapore. India's wholesale price index based headline inflation rose to an eight-month high in October at 7 percent, driven by costlier fuel and manufactured goods, raising the prospect of a fresh interest rate hike. Key basic derivatives are nowadays known as futures, forwards, options and swaps and their operating models are quite similar to each other. thank you very nice article to be learned..
i love this post, inspiring to me. good jobs, i like this..
Whatever information given it is very good for every one. I seen the website for the first time,thanks a lot for the contents which your provided in this site.